RRR/Hindle Megaphone Mufflers are made entirely from stainless steel. The Mufflers come in two lengths: A Shorty which is 12” and quite ah…robust in sound, and a Long which is 16” long and is a quieter choice for those who want to sneak home late at night! Both Megaphone Muffler lengths come with a choice of end tips (end caps); the Classic Tip or the Slash Cut/Reverse Megaphone tip. Both Muffler sizes (12” or 16”) fit all our exhaust systems and mount identically, so no matter what bike or model you have, the RRR/Hindle Megaphone Mufflers will bolt up to your bike the same way on any of our RRR/Hindle Vintage Racing Exhaust Systems. The Mufflers are a straight core design with a mild steel perforated baffle core surrounded by SS wool and ceramic wrap for long term durability. The Megaphone Mufflers have a 2 inch inlet and a 1 3/4 inch outlet. The Megaphones shape tapers from 2 inches inlet to 3.5 inches at the outlet. The Megas have a straight through design for maximum exhaust flow and are tuned to work with all of our Hindle Headers. Each muffler has a tab welded to the bottom back side with an 8mm hole to take a frame strap and a 10mm hole to attach to rear footpeg mount. Each muffler also has a spring tab welded to the back side for spring mounting the muffler to the tail pipe. These Megaphone Mufflers can be purchased with the complete Hindle Exhaust System ($699) or separately as muffler only ($250). Click on each picture to see a full description of that picture. This will help you a lot to understand the different end caps and size difference. RRR/Hindle Headers can be purchased separately ($550) or as a complete system with your choice of 12 or 16 inch Megaphone Muffler (with your choice of classic or megaphone tip) at $699. The discounted price of $699 happens automatically when you purchase the complete system. 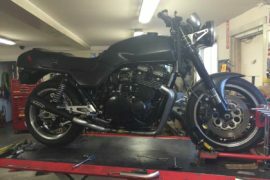 Replaces the stock mid-pipe and muffler with our Hindle slip-on adapter mid-pipe and Hindle muffler of your choice.